The native virgin’s bower (Clematis virginiana) and the invasive sweet autumn clematis (Clematis terniflora) have similar looking flowers and fruits, and are in full bloom in Indiana from August to September. Both can drape over vegetation, looking like a blanket of white flowers when in bloom. After blooming, numerous pistils with feathery styles give the fruit of both species a fluffy appearance. So how do you tell them apart? Check the leaves! 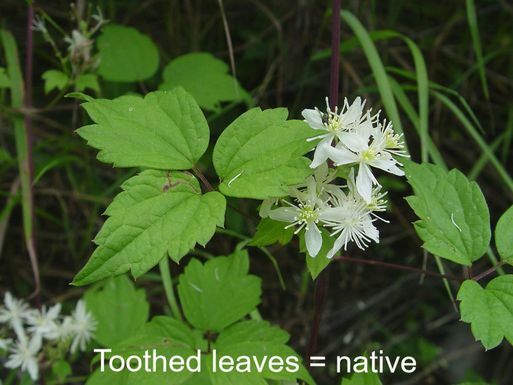 As shown in the pictures below, the native virgin's bower has toothed leaves, while the invasive sweet autumn clematis has smooth leaves. If you find the invasive Clematis, please report it at Report IN so we all know about it.